Has your company ever been accused of untruthful claims? Unfortunately, many businesses must deal with complaints or legal accusations that are either borderline true or completely absurd. Many times, companies must work extremely hard to decided where to issue statements or recall products. Of course, if there is ever a legitimate concern for the health, safety or well being of society, we encourage businesses to do what is right by the golden rule. We believe, in the long run, people choose companies who have a strong purpose and do what is right to begin with. So, if something ever goes wrong and your company is at fault, make it right because people will notice either way. That’s why, when it comes to large enterprise corporations like McDonald’s, the smallest sound can make a lot of noise. This appears to be the case in a recent situation with one of the latest happy meal toys. A small group of customers have called McDonald’s toll free numbers to complain and asserted that the “Talking Minions” toys are actually saying curse words. Reasonably, most would agree that children’s toys should not be swearing. And, as an established conglomerate, most people would reason that McDonald’s would not let that go unnoticed. However, if not responded to appropriately, this could be a public relations nightmare. To avoid reputation damage and be clear with the public, McDonald’s was issued a statement that their talking minions toys do not actually say curse words. They say nonsense words and noises. Now, you can always take a listen for yourself to decide, but the statement stands for itself. The lesson here is that being proactive about your communication strategy can prove effective for managing reputation. Furthermore, if a complaint or issue does arise, you company will have to deal with it whether it is true or not. This is true of companies in Denver as well as companies in New Delhi. There is no exception. So, you might as well be proactive about it. There are a few ways you can do this. First, speak with the actual customers who have submitted the complaints. Gather your facts and understand the problem. Try to resolve the issue at once. Secondly, you may notify your customers informally on your website, blogs, social media, etc. And finally, you can issue a public statement as McDonald’s did. Often times, large corporations like McDonald’s can prove to be great examples for small businesses. In this case, we were able see how a larger company deals with complaints that may or may not be true. However, the risk of reputation was very real. As business owners, we should continue to maintain our brands carefully for successful and sustained growth. So, after the McDonald’s PR nightmare, it only makes sense that something good comes along for the company to balance things out. Enter the McDonald’s secret menu PR dream. After one post on an online forum, McDonald’s got tons of free press without having the use the services of a business consulting firm to get it. One manager of an international McDonald’s location made claims about the McDonald’s menu having secret creations available, but only if the customer specifically requested it. You had to be in the know the benefit from the so-called secret menus. News outlets everywhere picked up the story only to debunk it. But nevertheless, McDonald’s got a whole lot of free press from the incident. 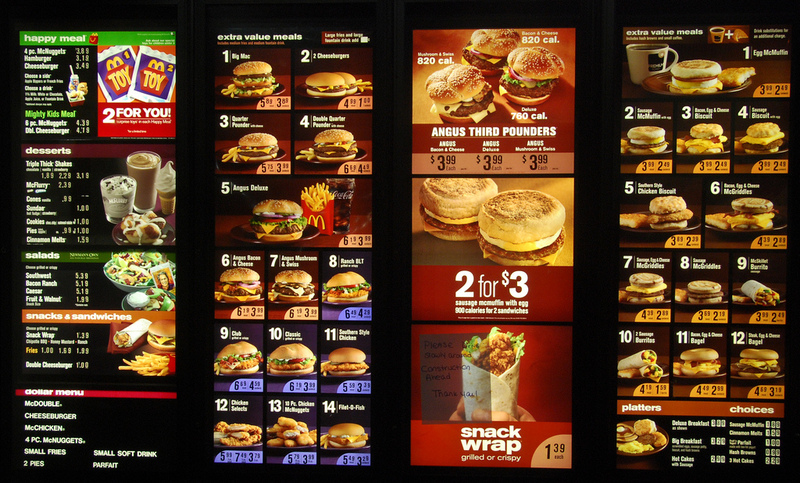 McDonald’s has gotten a ton of flack over the years for their less-than-nutritious menu. However, that may no longer be an accurate assessment. McDonald’s menu has now changed to incorporate more healthy options in attempts to get more people into the restaurant. For calorie counters with a craving for the golden arches, they now offer salads with grilled chicken. The McDonald’s bacon ranch grilled chicken salad with no bacon added is just around 300 calories, with an additional thirty calories or so added from the dressing. If you want a nutritious meal from the McDonald’s menu, it is certainly possible nowadays.